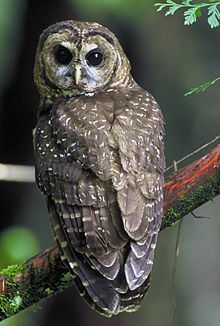 The northern spotted owl primarily inhabits old growth forests in the northern part of its range ( Canada to southern Oregon) and landscapes with a mix of old and younger forest types in the southern part of its range (Klamath region and California). The subspecies' range is the Pacific coast from extreme southern British Columbia to Marin County in northern California. It nests in cavities or on platforms in large trees and will use abandoned nests of other species. Spotted owls form long-term pair bonds (divorce is an uncommon occurrence) and remain in the same geographical areas year after year. Most spotted owls inhabit federal lands ( Forest Service, Bureau of Land Management, and National Park Service lands), although significant numbers occur on state lands in all three states, and on private and tribal properties. The worldwide IUCN Red List of Threatened Species status for the spotted owl species is " Near Threatened" with a decreasing population trend. As the IUCN Red List does not track subspecies, this status is applied to species across its whole range in Canada, the United States and Mexico. In 2007 a Captive Breeding and Release Program was created in Langley, British Columbia, Canada, with the goal of producing owls in captivity for release into protected habitat to prevent the extirpation of the species from Canada. The short-term goals of the Program include growing the captive population to 10 breeding pairs and releasing 10-20 offspring per year into the 300,000 hectares of protected old-growth forest. Long-term the Breeding Program aims to recover the wild population to self-sustaining numbers, approximately 300 adults, over the next 10–20 years. Thus far the Program has produced 8 captive-bred Northern Spotted Owls, including 2 second-generation offspring, and plans to begin releases in 2018 or 2019. The debate has cooled somewhat over the years, with little response from environmentalists as the owl's population continues to decline by 7.3 percent per year. In 2004 the U.S. Fish and Wildlife Service reaffirmed that the owl remained threatened, but indicated that invasion by barred owls into the range and habitat of the spotted owl was also a cause of declining spotted owl populations. ^ a b c Brokaw, Jeanne (Nov/Dec 1996). " Does Anybody Give a Hoot?" Mother Jones. Accessed April 3, 2013. ^ "Basic Facts About Northern Spotted Owls". Defenders of Wildlife. March 2012. Retrieved 2016-02-24. ^ "Northern spotted owl — Conservation Northwest". www.conservationnw.org. Retrieved 2016-02-24. ^ Freudenburg, William R.; Lisa J. Wilson; Daniel O'Leary (1998). "Forty Years of Spotted Owls? A Longitudinal Analysis of Logging-Industry Job Losses" (PDF). Sociological Perspectives. 41 (#1): 1–26. doi: 10.2307/1389351. JSTOR 1389351. Archived from the original (PDF) on August 30, 2006. Retrieved November 12, 2008. ^ " How Should We Manage the Barred Owl?" Olympic Peninsula Audubon Society. Accessed April 3, 2013. ^ Livezey KB (2010). "Killing barred owls to help spotted owls I: a global perspective" (PDF). Northwestern Naturalist. 91 (2): 107–133. doi: 10.1898/NWN09-37.1. JSTOR 40856470. Archived from the original (PDF) on May 25, 2017. ^ Livezey KB (2010). "Killing barred owls to help spotted owls II: implications for many other range-expanding species". Northwestern Naturalist. 91 (3): 251–270. doi: 10.1898/NWN09-38.1. JSTOR 40983223. ^ "WFPA - NSO Conservation in WA - Tribal Forestland". www.northernspottedowl.org. Retrieved 2016-02-24.